Happy Christmas to everyone, particularly to those who are suffering from the atrocious weather at the moment. I guess all of us will be having trouble getting into the woods, but this is just an inconvenience compared to those who will have had their home flooded. 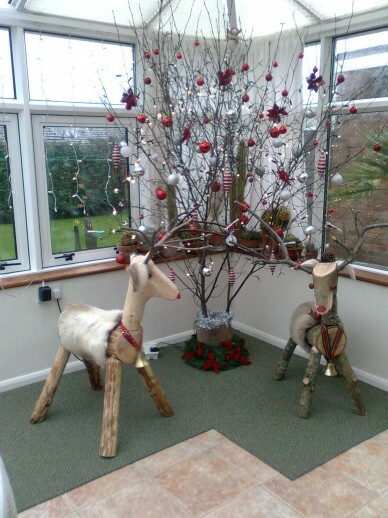 It looks like Rodney was able to get into his wood and produced a fine decorated tree guarded by his two trusty reindeer! Send me your pictures of Christmas trees or decorations made from something out of your wood and I’ll post them up here, or put them to the forum. Sadly as many of you know, SWOG will be losing it’s founder member in the New Year. Tracy has been an inspiration to all over the past 5 years, tirelessly organising meetings and courses, building contacts with other groups and pooling it all together on this site and the forum. She will be greatly missed, but we wish her good luck as she concentrates on her teaching career.